Participants during the Annual Cannabis Walk on 5 May, 2018 in Cape Town, South Africa. About 2,000 participants joined the annual march in support for the legalisation of cannabis. (Photo by Gallo Images / Brenton Geach). 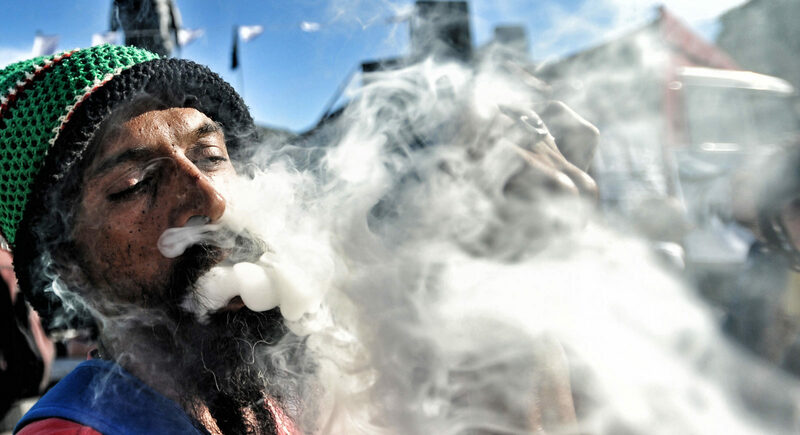 On 18 September, the Constitutional Court ruled that the cultivation and use of marijuana, or dagga as it is locally known, is legal if it is for personal use and if used in private. It confirmed an earlier decision in April 2017 of the Western Cape High Court which declared parts of the Drugs and Drug Trafficking Act and the Medicines and Related Substances Control Act inconsistent with the constitutional right to privacy. This means I could still get arrested for smoking weed on Melville’s 7th street or anywhere else that is not private. Ironically, supporters of Gareth Prince, the main respondent in the case, gathered outside the Constitutional Court and celebrated the ruling by lighting up in a public space, which is still considered a crime. The Mail & Guardian reported that National Police Commissioner, General Khehla Sitole, recently instructed all police officers in the country, including the Hawks, to cease arresting people “for the private use, cultivation or possession of cannabis”. This decision was communicated in an internal directive that was sent to all commissioners and police units around the country. However, the text of the directive is not as unequivocal as the M&G made it out to be. “A member of the SAPS must exercise their discretion whether cannabis is possessed for personal consumption. In exercising this discretion members must take all relevant circumstances into consideration, including the quantity of the cannabis found in possession of the person,” the directive reads. The Constitutional Court ruling does not mention what amount of dagga would qualify as “personal use” and what amount qualifies as “dealing”. These details, so the ConCourt ruled, should be determined by the legislature, which has two years to amend the relevant laws. In that transitional two-year period, the police have discretion to determine what falls under “personal use” and what would qualify as “dealing” or “selling”. This police discretion to determine what is private and what amount of dagga should be considered for personal use,is problematic, said Myrtle Clarke, one half of the Dagga Couple. Clarke and her partner Julian Stobbs became the Dagga Couple after they were arrested for possession of dagga in 2010. “We thought we were being robbed,” Stobbs said during a TED talk the couple gave in Cape Town. When they heard men shouting and knocking, Stobbs went to open the door in his underpants and faced the barrels of six guns that were trained on him. “Where is the drug lab?” the armed police officers yelled as they ripped apart the interior of the Clarke/Stobbs’ home in Lanseria, close to Johannesburg. What Clarke and Stobbs did next was as unexpected as it was unprecedented in South Africa. Instead of anxiously awaiting the outcome of the criminal case, they sued seven different government departments for a host of human rights violations. The basic premise of their claim is that the plant is not as harmful as it is made out to be by the lawmakers and should be completely legalised; from growing crops and seeds, to cultivating hemp, to recreational and medicinal use; as well as the buying, selling and trading of the plant. Their case, dubbed the “trial of the plant”, came before the High Court in Pretoria in 2017 and is expected to continue in the near future. Linked to this case is an initiative, set up by the Dagga couple, called “Join the Q”. People who have been arrested for cannabis can join the queue of arrestees who have applied for a stay of prosecution, pending the outcome of the trial of the plant. Currently there are 104 people in the queue. Cannabis arrests are one of the biggest SAPS arrest categories. In 2017/2018, 323,547 were people arrested for drug-related crimes, according to the South African Police Service’s (SAPS) crime statistics. This presents a 10% increase compared to the previous year. The police revealed in their 2015-2016 annual crime report that, nationally, possession of cannabis made up for a staggering 65% of all drug-related crimes recorded by police. This statistic has not changed much since 2006-2007. This means that in 2017, roughly 200,000 people in South Africa were arrested for a plant that scientists increasingly claim has very few harmful effects, especially compared to the legal substances alcohol and cigarettes. These arrests cost the state and taxpayers dearly. The Anti-Drug Alliance calculated in their 2016 report, At What Cost – All Rands and No Sense, that it costs about R89 to arrest someone, R365 to keep a person overnight in a cell, R671 to investigate possession of dagga and R398 for court proceedings. In 2014-2015, R3.5-billion was spent on dagga criminalisation, while the annual street value of the herb is an estimated R1.5-billion. While the new ConCourt judgment should lead to a decrease in dagga arrests, Clarke is wary of the powers that still rest with the police. A case in point is Charmaine Wendy Sinclair’s arrest on 21 September, three days after the ConCourt ruling. The police deemed the 470 grams of cannabis in her possession an illegal amount. The Hawks stopped her close to the toll gate at Port Shepstone in KZN, as Sinclair was driving home. Sinclair was with her daughters, 21 and 12, and a friend. The friend had approximately a kilogram of cannabis on her. Sinclair, a mother of three, claimed she was not handed an arrest or search warrant. The Hawks ripped apart the interior of her car. Sinclair intended producing cannabis oil with the marijuana, to help her daughter manage the symptoms of her ailments; she has type I diabetes, lupus and a condition that affects her oesophagus. Cannabis oil requires large amounts of raw cannabis. The Hawks brought the women and girls to the police station in Port Shepstone, where Sinclair was charged with possession, her friend with dealing and, to Sinclair’s astonishment, they charged her 21-year-old daughter with dealing as well. “All they found on her was a crusher,” Sinclair explained. When Sinclair pointed out to the cops that the Constitutional Court had just ruled that possession of dagga in private was legal, the officers denied that it had national application. The three women were released on R2,000 bail each and are expected back in court on 15 October. Hawks spokesperson Hangwani Mulaudzi confirmed the sequence of events, but claimed Sinclair was arrested for dealing, not possession. Sinclair’s charge sheet, meanwhile, reflects the charge of possession of cannabis. In follow-up correspondence, Mulaudzi said that the courts must decide on her case, if there was a wrongful arrest or not. While it should be relatively easy for Sinclair’s lawyer to get their client acquitted, Aidan Berry, who was arrested for a similar amount, will probably struggle more. He was arrested after the Western Cape High Court judgment but before the constitutional affirmation of that decision. Berry, who owns a construction company in Port Elisabeth, was unpleasantly surprised when four different police units – a gang unit, the flying squad, the regular SAPS and the narcotics squad – entered his premises on 14 March. Berry claims the Hawks seized his car, his fiancé’s car, his laptop, tablet and iPhone, items Berry had purchased from revenue generated from his (legal) construction business. The Hawks did not provide a warrant and have not responded to Berry’s queries around the whereabouts of his possessions. “I started growing medicinal marijuana after my father died from cancer. I sent a sample of my plants to Durban, to get it tested for medicinal use. Two of my friends, one is a Parkinson’s sufferer and the other has a tumour in his eye, wanted to start using the oil instead of the heavy medication the doctor had prescribed. The Hawks intercepted my shipment,” Berry explained. Shortly after his arrest, Berry’s friend with Parkinson’s died. Berry, who was arrested for dealing in cannabis, and his fiancée, who had a nervous breakdown following the arrest, will appear before the magistrate on 17 October. Naidoo failed to respond – despite several emails, phone calls and messages – to further questions around this case, including the claim that there was a case of mistaken identity or why 28 officers and 14 police vehicles were sent to arrest someone who was clearly growing for private use. The Constitutional Court ruled that the decision would not have retrospective effect, it will not apply to people who have been arrested for dagga before the decision, and they cannot challenge their arrests under the new framework. But what about Berry, who was arrested in between the two decisions? However, the distinction between personal use and selling/smuggling is still subject to the police’s discretion. Clarke and Stobbs, who say the criminalisation of dagga is the last apartheid law that needs to be overturned, advocate for a general amnesty for anyone ever arrested for dagga. “We want every cannabis conviction overturned and all criminal records expunged,” Clarke said. The complete decriminalisation of the herb would free up R3.5-billion in police resources. This could be put to good use in combating the worrying 7% increase in the murder rate, contained in the latest SAPS crime stats. “Police analysis of crimes reported in the first three months of 2017 showed that 34,468 women were assaulted, an average of 574 cases a day (..). During the same period, 16,922 children were assaulted, an average of 282 cases a day, and 738 women and 704 children were raped. Perhaps eradicating violence against women and girls will become a more urgent crime fighting goal than prosecuting people who produce cannabis oil? Time will tell.